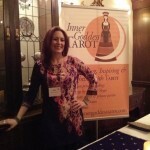 This year’s Readers Studio Tarot Conference stirred up a lot. We went deep. We went fearlessly into the shadows, faced our own demons, doubts and nightmares, and came out feeling blessed. Sound like a relaxing weekend away? That’s not the word I would choose…it was blissful, intensive, illuminating, draining, overwhelming and inspiring, and I can’t wait to go back next year. Readers Studio is a Tarot dream come true. 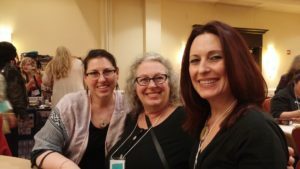 It is three days of intensive Tarot study, play and exploration, all in the midst of the high energy of about 200 or so Tarot icons, professionals, and enthusiastic amateurs. Last year I was a nervous and excited “first timer”, this year I was a slightly less nervous and even more excited second-timer. Readers Studio brings together the most fascinating, kind and down to earth people I have ever met, it is a completely welcoming and safe place, but the level of energy can take its toll on us sensitive types unless we take steps to pace ourselves. This year, the three keynote speakers all touched on similar themes…fear, our shadow side, what blocks us from being who we really are, and how to transcend these boundaries ourselves and help others to do so as well with our cards. As I said, this was deep work. And we were really ready for the party and Beltane ritual on Saturday night. Before I go into details about the conference, I want to talk a little about fear. Since I started my Tarot business, FEAR has been my constant companion. Don’t get me wrong, I love what I do, and I am 100% committed to this path, but a lot of the personal work that I have been doing over the past year has to do with shifting my mindset, away from panic and fear, to joy, curiosity and detachment from outcome. If I let it, my mind is very good at running away with itself, creating scenarios and outcomes at lightning speed, usually concocting stories that end in disaster, poverty or other rather dramatic disappointments. Why is this? I am a happy person, an intelligent person, I am always looking for the positive and empowering for my clients, friends, family. Why is it that when it comes to myself, the voice in my head speaks of failure, not being good enough, causing trouble for those around me? I KNOW it’s not productive, but up until very recently it has been the default. I can see how fear has blocked me. 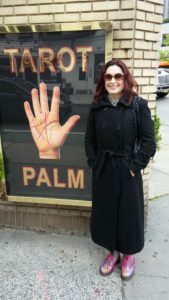 So crazy, I am a Tarot reader, which is not at all a conventional path, but because of fear I have limited myself to the safer, more conventional aspects of the profession. Fear tells me that if I stretch, if I access the true core of my being and put it out into the world, I will either fail, find that I am just totally ordinary, or I will make myself vulnerable to attack. So today, thanks in large part to the work I did at Readers Studio, I say goodbye to fear. I invite my fear to have a nice doze, to stop whispering in my ear, to only appear when I really need it. 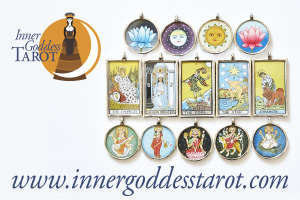 Stay tuned for some new and exciting stuff from Lori Lytle, Inner Goddess Tarot! It’s time to get REAL, to bring out what I’ve really got! Ok, thanks for listening, I now return you to Readers Studio 2016! The first speaker was Heatherleigh Navarre, the current force behind the Boston Tea Room, a family business that has been as been providing award-winning psychic services for over 30 years. (It’s located in Ferndale, Michigan…any of my Toronto friends feel like a road trip?) 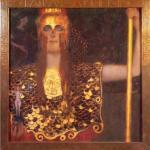 She is a Tarot and tea leaf reader, psychic medium and meditation coach, and a new hero of mine. 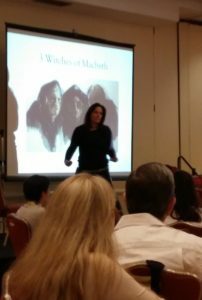 During her talk at RS, Heatherleigh was so engaging…she told heart-wrenching (and yet funny and easy to identify with) stories about her own past fears about reading Tarot, and shared common fears expressed to her by other Tarot readers, both amateur and professional. It’s amazing, even the most seasoned of us still sometimes feel those fears…”I’m not good enough, I don’t know what I’m doing, I’ll never make a living at this…”. 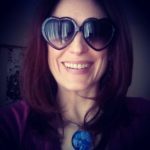 Heatherleigh led us through exercises that showed us how to work with our fears, to put them into perspective, and to see them as gifts that enhance our Tarot practice. Sasha Graham is a Halloween baby (how cool is that! ), and the author of Tarot Diva, 365 Tarot Spreads (highly recommended!) and the upcoming 365 Tarot Spells. She continued our journey into the shadow side, helping us to see the range of meanings in the cards, from the positive and bright to the darker and self-sabotaging. We looked at the 9th Gate of the Celtic Cross spread, exploring how our hopes and fears are intricately intertwined, and went through a deep meditation that helped us to release what may be holding us back. 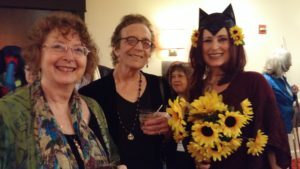 Barbara Moore has published many books on Tarot, including Tarot for Beginners, Tarot Spreads, The Steampunk Tarot, The Gilded Tarot, The Mystic Dreamer, and Tarot of the Hidden Realm…and there are mysterious mentions of more on the way. In the first part of her presentation, she talked about making space, the importance of clearing away personal clutter so that it doesn’t keep you small, or get in the way of serving your client. Thankfully, after all this deep work, she ended on such a lovely note, the Art of Blessing. We learned how to create a blessing based on a Tarot card, and ways of delivering this blessing in a genuine and meaningful way. I plan to incorporate this into my readings…a beautiful way to inspire and keep the message of a reading alive. 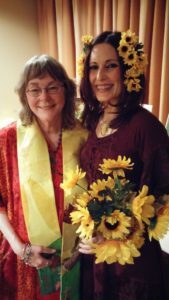 Aside from these wonderful presentations, one of the highlights of the weekend for me was a beautiful Beltane ritual led by Beth Owl’s Daughter, and the daily meditations lovingly crafted and delivered by Jayni Bloch and Carolyn Cushing. And of course, the Saturday evening dinner and dance party. What a great balance of serenity, study, and blowing off steam. To close, I’d like to tell you about a last very moving experience. Rachel Pollack generously and spontaneously offered to do one card readings for us using the prototype of her upcoming deck, created with Robert Place, the Raziel Tarot. 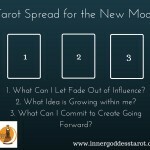 I asked her, “What do I need to know to deepen my Tarot practice?”. 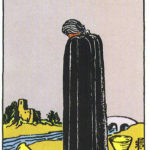 I received the Death card (the image can be seen here). Talk about tying into the theme of fear! Rachel told me that the meaning of the card, in this deck and in my particular case, spoke to the idea of surrender to the Goddess…rather than needing to die, I need to let the Divine in, to let the Goddess kiss me…the Goddess is there, She wants to connect, let her. Deep thanks to the Amberstones and all the attendees of Readers Studio 2016 for making this a life-changing, fun, unsettling, inspiring and unforgettable time. See you next year. Were you at RS2016? I’d love to hear about your experiences! Thinking of coming to RS 2017? Feel free to contact me for any info, advice or encouragement!